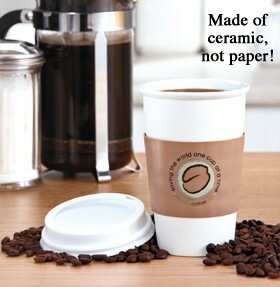 The Ceramic Coffee Cup With Silicone Lid comes complete with a silicone sleeve to keep your fingers from getting burnt. Save the world one cup at a time! Use one of these 12-oz. ceramic cups again and again, rather than drinking your brew from a paper or foam cup that will spend years in a landfill. Its double-walled construction keeps coffee, tea and hot chocolate warm. The silicone sleeve provides additional insulation and gives you a firm grip, while the silicone lid holds tight to prevent spills. The Eco Friendly Coffee Cup is designed to fit in your car's cupholders. Measures 6" x 4" dia.